I'm not sure if I've ever wanted a vacation to happen sooner than I want our trip to the beach to get here this summer. In 29 days, we'll be arriving in Holden Beach, North Carolina - it's a quaint little beach town at the most southern part of NC. The type of place that doesn't have high rise hotels and a McDonald's on every corner. There's one grocery store to buy all your food for the week and a cute family owned coffee shop to pick up your morning latte if you choose. 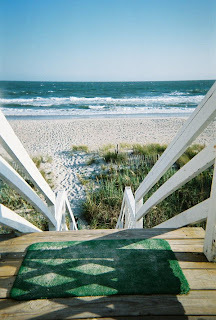 I'm relaxed just thinking about the beach...a great way to wrap up the week. So much to look forward to ... in less then 30 days! A few weekends ago JJ and I decided to take a trip down to Findlay Market to pick up some fresh goodies. If you're not familiar with Findlay Market in Over-the-Rhine, it is Cincinnati's oldest public market and is named after General James Findlay, a veteran of the War of 1812 and also a former mayor of Cincinnati. The open air market opened in the 1850's and has undergone may transformations over the years. The market was enclosed in 1902 so that refrigeration could be added, and in 1972 it was listed on the National Register of Historic Places. After extensive renovations in the mid 1970's and more recently 2002-2004, Findlay Market now offers a wide variety of fresh produce, arts and crafts, and meats and cheeses, most of which are locally grown in the area. One of our favorite vendors at the Market is the family owned and operated Kroeger & Sons Meats. It's been around since 1972 and offers 40 different varieties of fresh pork and chicken sausages. They have this great sign hanging up, which is sure to get your attention! Here's a photo of the sausage counter..talk about lots of choices! If you're living in Cincinnati, I hope you'll stop by Findlay Market sometime soon to check out all the great food and support the local vendors in our area. If you an out of town reader, maybe next time you're in the 'Nati you'll want to visit this historic Cincinnati landmark. I finished the 100 MS Bike Ride! 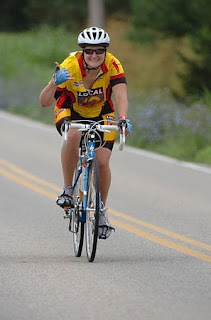 The 2008 MS Bike Ride was a great adventure this past weekend! The start time is always early (we got up at 6am) and still didn't get there in time for the group picture...but we made it to the YMCA in Lebanon for the start time of 7:30am. It is so great to see all the riders on Day One, so excited, a little nervous, just ready for the adventure of the day out on the road. And what a day it was, the weather started out great, a bit over cast & cloudy, but man did the skies open up around Mile 35...first like sprinkles of rain came down, okay no big deal...I've ridden in the rain before. At this point I was still on pace to attempt the 75 mile route, but then the rain started down pouring...loud rumbles of thunder, cracks of lightening...I've never ridden in conditions like this. Kind of scary actually, we finally got to the rest stop and gathered with the others under the open air shelter. At this point, I wasn't interested in continuing to ride in these wet conditions - and the organizers decided to close the longer route, so after the rain let up, everyone got back on the route and rode back to the YMCA. One fun highlight of Day One's route was the ride past the Solid Rock Church along I-75...and if you know this area, you'll know that I'm about to show you a picture of what I like to refer to as the "Touchdown Jesus Statue"! Others have named it "Big Butter Jesus", which is good too, and of course I had to detour off the route for just a second to capture a photo in front of this awesome site! I'm thankful for my riding buddies through the weekend...I call us "The Three Musketeers"! Only this year, Andy decided to become a "Beast on the Bike". Last year, we were all riding at the same pace, mostly at the same cadence, but Andy got himself a new bike and took off this year! It was awesome to see him pound up the hills and we mostly only saw him at the rest stop (only b/c he waited for us!!). The route for Day Two of the ride was a bit more challenging than Day One...more hills and steeper climbs, in fact the 1st hill was so tough that many of the riders (myself included) had to hop off the bike and walk up the windy roadway. Despite some challenges with my chain & gears not cooperating, I pushed through the miles and finished strong one the 50 mile route for the grand total of riding just over 100 miles, over the 2 day weekend event. 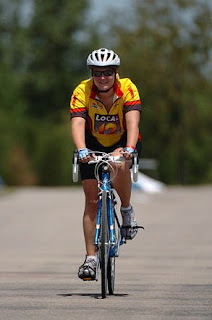 I feel very accomplished to have completed this ride for the second year and to help raise money to benefit the MS Society. Thank you to everyone to has encouraged me to keep going with my training and a special shout out to everyone who donated to my fundraising web page! It's here - the MS 150 Bike Ride is this Saturday & Sunday. I'm very excited for the new route and looking forward to meeting lots of new people along the ride. My Dolce is going to be a great bike have this year and I know it will allow for a comfortable ride. Thanks to everyone for your support and donations that have been made to my fundraising webpage. I'll post lots of pics from this year's ride for everyone to see. Thanks again for all the words of encouragement!! One of my favorite things about Cincinnati is the annual Northside 4th of July parade. It's a great place for people watching...it is filled with lovely characters, dressed up in all kinds of outrageous outfits and also full of extremely friendly people who are celebrating our nation's birthday. Northside is a great neighborhood where people from all walks of life gather to enjoy a relaxed community atmosphere. Here are some great pics from the parade...Enjoy!